Sea Lab campers learn about marine life, up close. The 110-foot-long tall ship “Irving Johnson” will visit King Harbor on Sunday May 18 for the annual Redondo Beach Sea Fair. The Sea Fair is a free, family-friendly event hosted by the SEA Lab and the King Harbor and Redondo Beach yacht clubs. The fair promotes safe boating and environmental awareness, while highlighting recreational opportunities in King Harbor. Heal the Bay will organize a beach clean-up and sand sculpture workshops will be offered. The Bob Meistrell Memorial Tank will also be dedicated. Meistrell, a co-founder of Dive N’ Surf and Body Glove, passed away last summer. Beginning June 1, the SEA Lab will be open daily, except Mondays. The SEA Lab also holds summer camps for kids. The Mini Mariners group (ages four to six) runs July 14-18 and July 28 – August 1, Monday through Friday from 9 a.m. to 1 p.m. for $250. Campers learn about marine life through crafts, games and hands-on activities. The Ocean Explorers group (ages seven to 11), runs July 21-25 and August 4-8, Monday through Friday from 9 a.m. to 3 p.m. for $350. 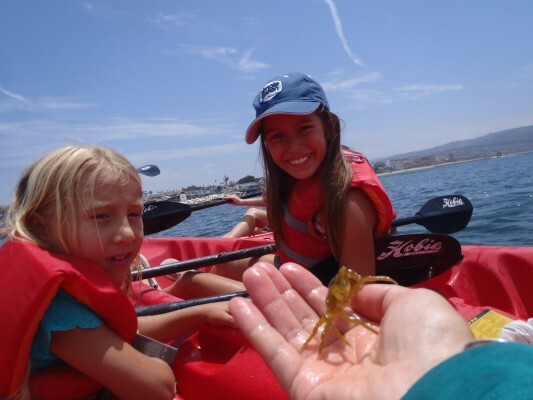 Campers learn what lives in our sandy beach, explore tide pools and go kayaking. Registration deadline is June 15th. Register before June 1 and receive a 10 percent discount. All SEA Lab programs are staffed by college students trained by the Los Angeles Conservation Corps and dedicated local volunteers.